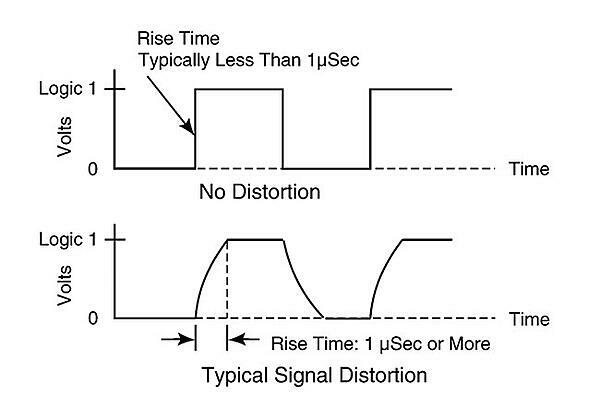 Delayed signal rise time appears in the leading edge of each pulse as a rounded curve, while leaving the trailing edge straight. It creates the characteristic shark’s fin appearance. This can interfere with the ability of the receiving device to cleanly detect individual pulses in the stream. In order for the encoder to send a signal over the wire, it effectively needs to charge the wire. The longer the cabling run, the more time this takes. Rise-time delays can also show up in encoders with open-collector output drivers. Here, the rise time depends not just on cable length but on the load, the encoder speed, and the internal pull-up resistor of the encoder. The higher the resolution, in general, the greater the delay. Is the pulse stream asymmetric? Do the pulses have the characteristic shark’s-fin shapes? Is the signal cable connecting the encoder to the readout device longer than recommended for the output driver? Are you using an open-collector output driver? If so, does it have a pull-up resistor? Delayed signal rise times are most likely a system issue and not an issue with the encoder itself. If the distance between encoder and readout device is long, invest in a low-resistance cable. For encoders with open-collector output drivers, check the pull-up resistor. Using a pull-up resistor with lower resistance will shrink the delay and sharpen the leading edge of the poles. The trade-off is that it also increases the current to the device. This can put stress on the output driver, leading to premature failure. With open-collector output drivers, it is best to take a balanced approach. Size the resistor so that the leading edge slopes a small amount but remains within specification.